A little while ago I went to see the UK’s favourite Psychic - Sally Morgan. I was interested to see what her show was like and if she would be able to challenge my preconception that no-one can actually speak to the dead. If you read my previous blog on the subject you’ll know that I wasn’t really that impressed – but thanks to the hard work of my friend Steve we’ve been able to make a rough transcript of the show and count up how successful Sally was at bringing messages from beyond the grave. · Is she making specific statements? · Is she speaking clearly or in riddles? · How Many statements are incorrect? · Were we asked to give information? Using these as a guide, I measured 290 separate statements made by Sally during the 2 hour show. The theatre had a capacity of around 600 and it was full (at £25 per head that’s £15,000 by the way). The number of statements is interesting; as it reminded me of the Birthday Paradox whereby all you need is a group of 23 people in the same room for it to be more likely than not for there to be 2 people who share a birthday. While birthdays and loved ones are quite different a room of 600 people creates a lot of chances for a statement to hit. Considering this, as well as Sally’s claims to have been guided by the spirits of relatives of people in the audience, you would expect her statements to be unerringly accurate. In actual fact, I counted 41 “hits” out of 290 statements - a success rate of 14%. Looking it another way, Sally Morgan (the UK’s favourite Psychic) made 249 statements that drew blanks from a room of 600 people (many of whom desperately wanted to speak to a dead relative). Which without wanting to be unkind is… not very good really. I enjoy a graph (I know, but those long Norfolk nights as a child were long and in Norfolk) so I’ve tried to create a visual record of her performance. By putting all of Sally’s statements chronologically in order we can check the frequency of her success and see a story of the performance. He’s confused about his death, Did he get thrown around? Were you with relatives today? Other two girls who also stood up, Did you stand up for Jeff? Somebody said Sam, may own a motorbike? and Sam owns the motorbike? And your cousin is in spirit? And your stepfather is in spirit? So even during her most successful 20 statement spell, Sally provided 6 different names and asked 10 different questions. If Sally was indeed in contact with “John” I wonder why he didn’t tell her ”My name’s John, I can see Jeff’s mum in the crowd, get her to say hello to my Mum called Doris for me will you? The car crash was horrible but I’m OK now”. I’m also confused as to why Sally, who is apparently talking to the spirit of a particular person, can’t even tell if it’s Sam or Andrew who are dead. The best conversion that Sally had all night, was with a regular attendee of her shows (Skegness at least), who also claimed to understand a further 2 messages during the night. If I were a fan of Sally’s, I might wonder why the only real run of success she had all evening came when speaking to someone with whom she had already had spoken at a previous show. Where it seemed Sally hadn’t met the audience member before, she was significantly less successful. And did you hear it 'like that'? Do you know who Emma may be? Do you know who Jonny is? Is there the name cliff? This time of year is poignant time for you, start of Nov, up to the 12th? Again, every single statement is a question and the more specific the question the less success Sally has in being able to provide anything meaningful to the audience member. did you see a photo of Jonny? While, the questions about the documents and photos are quite accurate (if a little obvious), Sally manages to get the Spirit’s surname wrong twice, as well as mis-diagnosing him with Parkinson’s Disease. Oddly this conversation was with the same audience member who claimed to be “totally sceptical” in statement 32. I had a brief conversation with him after the show and he was an absolute convert - clearly, he had only remembered the “hits”. This really does show the power of our memory’s ability to deceive us, and the importance of being able to create an accurate record of events, to consider dispassionately. Without this, like the regular attendee from statements 1-11, the skeptical audience member seemed to have done Sally’s hard work for her. 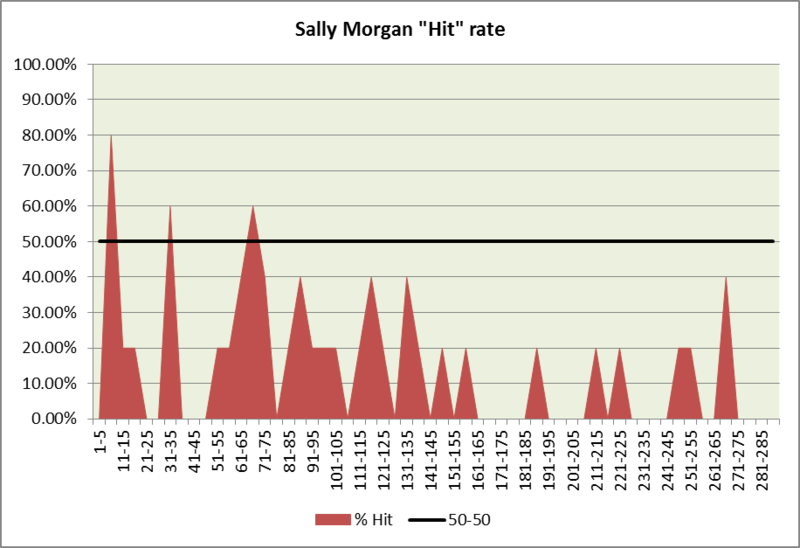 Sally was apparently guided by the spirits of people who knew members of the audience; however it’s undeniable that the likelihood of randomly finding a hit within a room of 600 people is very high. When looking at Sally’s evening, I’ve intentionally cherry picked the best moments from her performance – the ones where Sally appears to be providing the most accurate information. Even considering only the best of Sally’s readings, I can’t say I’m very impressed by these conversations or Sally’s abilities as a psychic. I know my Granddad was a lovely man and that he loved me. Most people would be able to say the same. So, even if these super natural powers are real, what possible insight and use could a psychic provide, if all they can do is pass dull blandishments from one side of the mortal plane to the other? Isn't this the psychic who didn't know that her husband was a homophobic thug? Nice work. I was interested to see the way you've put this in context of the hit rates one might expect with 600 folk in the room. People in the audience seem to be satisfied with very little substance! Thanks Jo. If I'm honest there were a lot of embarrassed chuckles from the audience around me - particularly in the 2nd half. I'm told Derek Accora at least puts on a bit of a show (but I really would save your money if I were you).